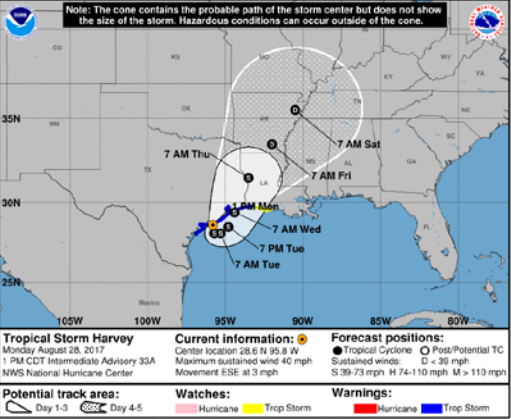 Tropical Storm Harvey has moved back out to the Gulf of Mexico, allowing it to pick up moisture before returning to hit land in eastern Texas and Louisiana. The storm is forecast to make its second landfall near Galveston, TX, bringing continued rain to the eastern Texas coastline. The storm will continue to sustain winds of around 40 mph at its center. 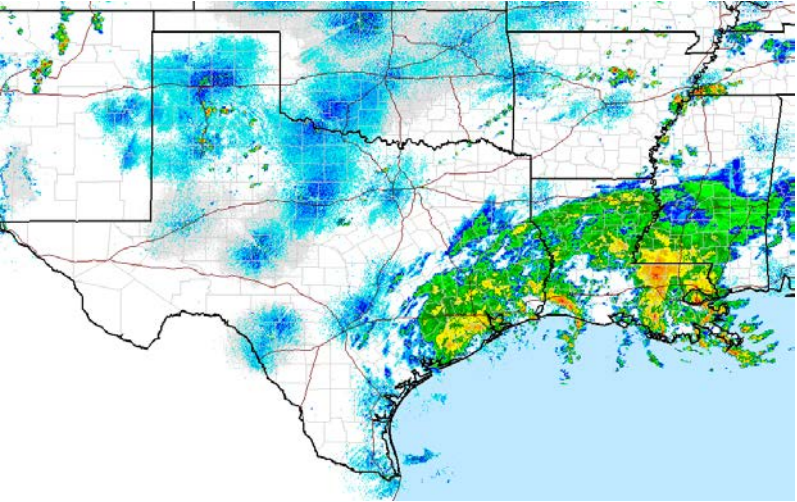 Houston is expected to continue receiving heavy rain, which will continue through Wednesday. Rains will begin to lighten on Thursday, bringing a much-needed break. Some areas have seen rain falls amounting to nearly 40 inches, making this one of the worst flood disasters in U.S. history. Harvey has been exceptionally dangerous because of how slowly the system has moved. Averaging only 3 mph, the storm has had plenty of time to pour rain down on the Texas coast. Nearly 60 hours after hitting land, Harvey remains a named storm, which is a record amount of time for a storm landing in Texas. As it keeps moving, rain is making it was way now to parts of Mississippi and Arkansas. Draining all the water out of the region will likely take until after Labor Day, according to the Weather Channel. As we mentioned earlier today, refineries in Beaumont account for much of the product supplied along the Colonial Pipeline to Southeast consumers. Today, ExxonMobil announced that their Beaumont refinery was running at reduced rates, an ominous sign that the region may see refining come offline temporarily as Harvey lands in the U.S. Adding to concerns is the near shutdown of Motiva’s 610 kbpd refinery in port Arthur. The company has brought in pumps to fend off rising flood waters, but it’s not known how long the pumps will be able to keep up with the water. The addition of Beaumont/Bay Town to the list of refining hubs shut down by the storm would be a major blow to supply in Texas and the overall marketplace. These two refineries represent an additional 1 MMbpd coming offline if they fail, bringing the total outage of production to 4 MMbpd, or roughly 22% of total U.S. capacity. Concerns over the shutdown caused gasoline prices to jump all over the board today. Gulf Coast gasoline finished up 9 cents and diesel closed roughly 3 cents higher for the session. On the electricity side, the DOE reports that nearly 300,000 customers have lost power, representing 2.5% of Texas customers. Less than 1% of customers (2,500 customers) in Louisiana have lost power. AEP Texas, the most effected utility, expects 95% of the outages in Corpus Christi to be repaired by Wednesday, while 95% of the outages in most other areas will be repaired by Saturday.